Where do technological innovations come from? We have two mental images. One is of a lone genius working in a laboratory or garage, misunderstood until, at long last, the world appreciates her contribution. The other is of a team of busy bees, experts working at a corporation or government agency, the Manhattan Project being the best-known example. 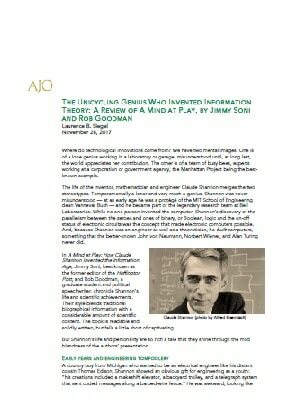 The life of the inventor, mathematician and engineer Claude Shannon merges the two stereotypes. Temperamentally a loner and very much a genius, Shannon was never misunderstood — at an early age he was a protégé of the MIT School of Engineering dean Vannevar Bush — and he became part of the legendary research team at Bell Laboratories. While no one person invented the computer, Shannon’s discovery of the parallelism between the zeroes and ones of binary, or Boolean, logic and the on-off status of electronic circuits was the concept that made electronic computers possible. And, because Shannon was an engineer as well as a theoretician, he built computers, something that the better-known John von Neumann, Norbert Wiener, and Alan Turing never did.